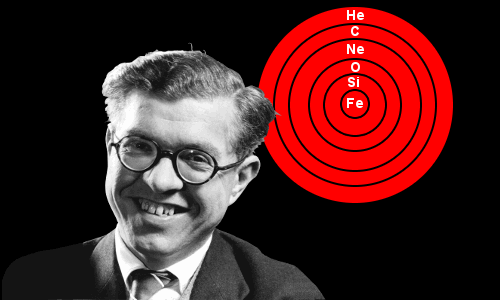 Fred Hoyle proved that the great majority of natural elements in the periodic table were made inside stars and distributed through space by supernova explosions. He coined the phrase ‘Big Bang’ while strenuously denying that there had ever been one. He argued for an expanding Steady State universe with no beginning or end. A controversial, often outspoken scientist, he never received a Nobel Prize, even though his work on the creation of chemical elements undoubtedly merited one. He delighted in taking dissenting positions on many of science’s big questions: he argued that the physical and chemical properties of the universe had been intelligently designed, and that life on Earth had been seeded from space. Fred Hoyle was born on June 24, 1915 in the small village of Gilstead, England, UK. His father was Ben Hoyle, a businessman in the cloth trade. His mother was Mabel Pickard, a musician and former school teacher – she taught Fred arithmetic before he started school. Money was usually very tight in the Hoyle home and Fred was an only child. Although Fred knew his 12 times table by the age of four, he was seven before he learned to read – his eyes had focusing problems. Strong minded from a very early age, he loathed the idea of going to school. He resisted starting at the usual age of five, only beginning when he was legally obliged to at six; and then he hated it. Fred skipped school for most of the following year – it bored him – recalling later that he learned more going to the cinema – he got in for a penny – and watching people at work than he would ever have learned at school. At age eight, on one of the days he actually turned up at school, his teacher hit him hard on the head. Aching from both the blow and a sense of injustice, Fred refused to go back to school. Unusually, the education authorities agreed to allow his mother to homeschool him – she had, after all, once been a teacher herself. At home Fred found a chemistry book and became very enthusiastic about the subject. He made gunpowder and, wishing to prove to himself that he was a real chemist, he synthesized phosphine – a highly toxic gas – in his mother’s kitchen. In less safety conscious days than our own, he personally bought chemicals such as concentrated sulfuric acid at the local pharmacy. His parents hoped Fred could win one of the small number of county scholarships to attend a grammar school. To achieve this, he would need to finish primary school with outstanding marks. With this in mind, and probably because he was driving his mother up the wall with his kitchen experiments, his parents enrolled Fred at the village school in Eldwick. He was now nine years old. His scholarship exam, which he sat aged 11, did not go very well. However, he performed well in arithmetic and was invited for an interview at Bingley Grammar School. There the headmaster learned about Fred’s interest in chemistry and sent him to talk to the chemistry teacher. At first the teacher could hardly believe the experiments Fred said he had done at home, but Fred described them in enough detail for the teacher to realize he was telling the truth. Fred won his scholarship. He would now have to walk four miles to reach school and four miles home. Fred Hoyle’s goal at grammar school was to win a university scholarship. At the age of 17 he achieved his goal. Soon, however, he was told the scholarship had been withdrawn; the year was 1932 and the great depression was biting hard: education spending had been cut. Hoyle had intended studying Chemistry at the University of Leeds. Angrily he returned to grammar school. The headmaster agreed he should prepare himself to win a scholarship to the University of Cambridge. Hoyle was startled when he saw how hard the scholarship exams were – he didn’t even know how to begin most of the problems! However, within a year he was able to reach the required standard and became a Cambridge freshman in October 1933, aged 18. Soon after arriving at Cambridge, Hoyle was told his standard of mathematics was too weak for an academic career in chemistry or physics. Strengthening it would be his best possible preparation for a degree. He was persuaded to devote himself to mathematics in his first year. This had an additional advantage for Hoyle – it meant he could dodge freshman science courses such as geology and botany. In the end, Hoyle did not return to chemistry or physics. He studied for a mathematics degree. Inspired by earlier Cambridge mathematicians such as Isaac Newton and James Clerk Maxwell, Hoyle decided his true calling was to apply mathematics to physics – theoretical physics. In 1936, close to his 21st birthday, he graduated with a Bachelor’s Degree in Mathematics (honors with distinction), winning the Applied Mathematics prize – the perfect qualification for a budding theoretical physicist. Refusing a Ph.D. for Tax Reasons! Hoyle continued at Cambridge, carrying out theoretical research in atomic and nuclear physics. He fulfilled the requirements to be awarded a Ph.D., then chose not to graduate: if he had, he would have lost his status as a student and been forced to pay more tax. In 1939, aged 23, four months before the outbreak of World War 2, Hoyle became a fellow of St. John’s College, Cambridge. In the absence of a Ph.D. degree, he maintained his low-tax status! Hoyle now planned to carry out his own independent research work. However, as a ‘student’ he needed an official supervisor. He approached the great Paul Dirac, winner of the 1933 Nobel Prize in Physics. Dirac was notorious for his aversion to research students, but he accepted Hoyle. Hoyle would later humorously recall that he became the student who didn’t want a supervisor paired up with the professor who didn’t want a student. Hoyle applied his nuclear physics expertise to investigate the behavior of stars: he was now working as an astrophysicist. His aim was to use the chemical composition of stars to understand their behavior. He worked in this field full-time until the summer of 1940, after which war work became his priority. During his wartime work – developing improved radar systems – Hoyle was head of a section whose workers included Hermann Bondi, mathematician; and Thomas Gold, physicist. In the evenings, as a diversion from the grim realities of the war effort, the three got together and considered the greatest question of all: the origin of the universe. They concluded that the universe had existed for ever. In 1948 they published papers in support of their position. Big Bang vs Continuous Creation. Hoyle believed the universe had existed forever. It is expanding because hydrogen atoms are continuously created. This seemed more appealing than the opposing theory that the entire mass of the universe had been created in an instant. In order to support his theory, Hoyle devised a new field theory of gravitation which included a matter-creating field. Hoyle himself coined the term ‘Big Bang’ as a disparaging description of the major competitive theory to the Steady State model: ironically, the Big Bang theory was named by its greatest opponent. The discovery of the cosmic microwave background radiation, announced by Arno Penzias and Robert Wilson in 1965, led most astrophysicists to favor the Big Bang model. Although Hoyle and his coworkers found ingenious ways to explain how the microwave background could be produced in a Steady State universe, they failed to convince most astrophysicists. Hoyle never abandoned his belief in the Steady State model or variations of it. In fact, his well-founded attacks on Big Bang theory pushed its supporters to improve their theoretical understanding of Big Bang physics and secure better observational evidence for its existence. Arthur Eddington first proposed that elements are made in the stars, properly called stellar nucleosynthesis, in 1920. He theorized that atoms of lighter chemical elements could be squeezed together to form atoms of heavier elements in the hot, dense interiors of stars. His suggestion was mocked by many in the physics community. In 1928 George Gamow showed how the strong nuclear force can overcome electric repulsion, allowing atoms of lighter atomic nuclei to merge and form heavier elements. In 1939 Hans Bethe showed that stars produce energy by nuclear fusion – converting hydrogen into helium. The synthesis of elements heavier than helium, however, remained to be explained. Astrophysicists believed stellar nucleosynthesis was relatively unimportant. They accepted George Gamow’s theory that the elements were formed very quickly after the universe came into existence in a flash. During the war Hoyle visited America. In Pasadena he met the eminent astronomer Walter Baade, who recommended to Hoyle that he should study supernovas. Hoyle, who believed the key to understanding stars was their chemical composition, now began considering how chemical elements could be synthesized when a heavy star undergoes the convulsions of a supernova. When the war ended Hoyle returned to Cambridge as a mathematics lecturer. In 1946 his work began to bear fruit. He showed that the cores of massive stars could reach sufficiently high temperatures and densities to bring hot atomic nuclei together to form heavy elements such as iron. If a massive star exploded, elements it had produced would be distributed into space. In 1954 his equations showed how the chemical composition of a hot star changes as new elements are synthesized. His theory agreed well with observations of real stars – particularly for the production of elements as heavy as sodium. He also described supernova-shell theory – the universe’s main source of natural heavier elements. 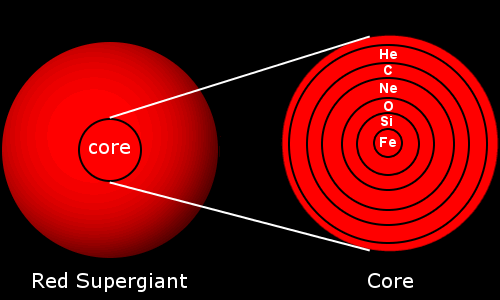 Massive stars produce the chemical elements in concentric shells in their cores. In a supernova explosion the elements are pushed out into space. In 1957 Hoyle and his coworkers published one of the most famous papers in the history of astrophysics – Synthesis of the Elements in Stars – informally entitled the B2FH paper after the surnames of its authors – Burbidge, Burbidge, Fowler, and Hoyle. In later years, Hoyle’s groundbreaking 1954 research would frequently be misattributed to the classic B2FH paper. The B2FH paper explained how the elements are formed in stars and made successful predictions about different environments within stars producing different isotopes of elements. Today we know that everything on Earth – including the soil, the water, and life – is made of atoms formed in exploding stars; we owe this to the original work of Fred Hoyle and his later coworkers. In 1958 Hoyle became the Plumian Professor of Astronomy at Cambridge. In his work on stellar nucleosynthesis, Hoyle was struck by the unlikelihood of carbon’s existence. His calculations showed that any carbon forming in a star would soon disappear to form oxygen. Yet the very fact he was around to consider the problem meant there must be an unknown process responsible for the universe’s carbon. This was an anthropic argument – i.e. the properties of the universe must support the conscious life that has evolved to observe it. Hoyle began to calculate, trying to identify the process. This led him, in 1953, to make what seemed like an outlandish prediction. His calculations revealed that if carbon-12 has a very particular property – a resonance level at 7.65 MeV above its ground state – then its production would be accelerated sufficiently to account for its abundance in the universe. He asked William Fowler (the F in B2FH) to do experiments to find this resonance level. Fowler refused, saying carbon had already been studied thoroughly: no such level existed. However, Hoyle could be very persuasive when it suited him, and Fowler spent over a week looking for the resonance level Hoyle had predicted. And found it! A truly stunning and unexpected discovery. Hoyle believed this discovery did more than anything else to convert physicists who had previously believed all the elements had been made in a Big Bang to accept the theory of stellar nucleosynthesis. Rather than believing God designed the universe, Hoyle speculated that the laws of physics in our current era may have been set by a previous, extraordinarily advanced civilization. In the early 1950s, the universe was believed to be about 4 billion years old. Between 1956 and 1958, Hoyle used observations of white dwarf stars to calculate that our own galaxy, the Milky Way, is at least 10 billion years old. In 1960, he and William Fowler calculated our galaxy is 15 billion years old. Today the Milky Way is estimated to be 13.2 billion years old and the universe is estimated to be 13.8 billion years old. Hoyle believed life on Earth was first seeded by organisms from space carried by comets and that space itself is filled with vast clouds of bacteria. He believed Earth and similar planets act as assembly stations where single-celled organisms from space get the opportunity to produce more advanced forms of life. Hoyle argued that the theory of evolution by natural selection is wrong: he claimed evolution is caused by viruses from space that sometimes merge with existing DNA in Earth’s organisms to produce mutations. He believed influenza epidemics are caused when Earth passes through clouds of influenza virus in space left behind by comet tails. The viruses pass through Earth’s atmosphere, causing diseases and sometimes sparking evolutionary mutations. It would be fair to say Hoyle’s ideas about evolution and influenza epidemics were and remain beyond the pale of mainstream scientists. It would also be fair to say, however, that scientists today are actively investigating the role of comets in Earth’s biochemistry. The ‘support for unorthodox ideas’ argument could also have been used to prevent Linus Pauling getting the Chemistry Nobel Prize, but, fortunately for Pauling, his unorthodox ideas came after he had been awarded the Prize. Hoyle married Barbara Clark in 1939. They had two children: Geoffrey, who became a science fiction writer; and Elizabeth, who became a stockbroker. Hoyle became a great popularizer of science, appearing on British radio and television, and writing popular science books. He was a voracious author of books. In addition to dozens of scientific books, Hoyle wrote, or co-wrote with his son, over 20 science fiction novels. His first novel was the 1957 sci-fi classic The Black Cloud. His A for Andromeda and Andromeda Breakthrough plots were made into TV series and he also wrote four children’s books and a libretto for an opera – having grown up in a home where his mother played Beethoven’s music on the piano for several hours every day, he was an enormous classical music fan. In 1972, at age 57, Hoyle was knighted, becoming Sir Fred Hoyle. In the same year, following a series of arguments about the direction of astronomy and astrophysics at Cambridge, he resigned from the university. He continued to work independently, writing many more books. Fred Hoyle continued working to the end, and also spent plenty of time on his favorite recreation – hiking in hills and mountains. He died on August 20, 2001, aged 86, in Bournemouth, England as the result of a stroke. "Fred Hoyle." Famous Scientists. famousscientists.org. 11 Jul. 2016. Web. On Nuclear Reactions Occurring in Very Hot Stars. I. The Synthesis of Elements from Carbon to Nickel.